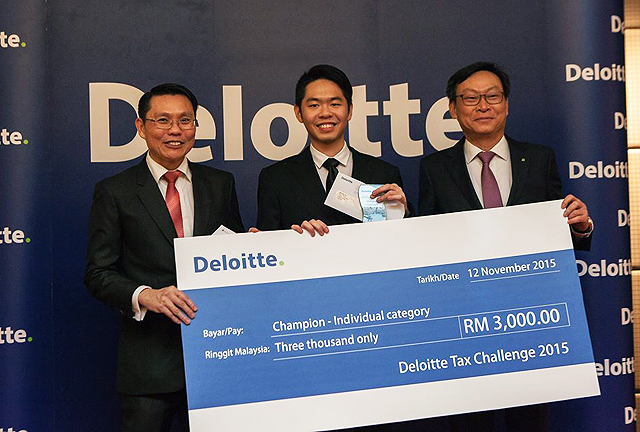 UTAR Faculty of Accountancy and Management final year student Mah Wen Jian won the first place for individual category in Deloitte Tax Challenge 2015 (DTC 2015) held in Maple Junior Ballroom, One World Hotel, Bandar Utama, Selangor on 12 November 2015. Mah received RM3,000 cash prize, books on taxation, a one-year online Malaysia Master Tax Guide subscription sponsored by Wolter Kluwer’s CCH, a trophy and an offer from Deloitte Malaysia. Mah said “The challenge tests tax knowledge on how to apply the principles and doctrines in the scenarios and case given. It also evaluates the participants on their writing and presentation skills”. He added that he gained a lot of knowledge on taxation during his internship and he joined this challenge to expand his experience. Mah thanked his lecturer at UTAR who provided guidance and meaningful tips during his participation in the challenge. He hopes that his winning will motivate his fellow classmates and juniors to explore beyond boundaries and gain new experiences and knowledge by participating in competitions. Mah will be representing Malaysia in the Deloitte Southeast Asia Region Competition to be held early next year. Besides UTAR, the other participating universities were Tunku Abdul Rahman University College (TAR-UC), Sunway University and Universiti Sains Malaysia (USM). 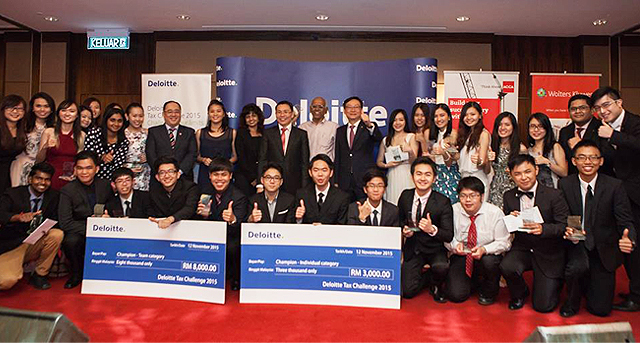 Organised by Deloitte, the Deloitte Tax Challenge is an annual tax-based competition aimed to encourage students from higher learning institutions to hone their tax knowledge as well as improve writing, speaking and presentation skills.